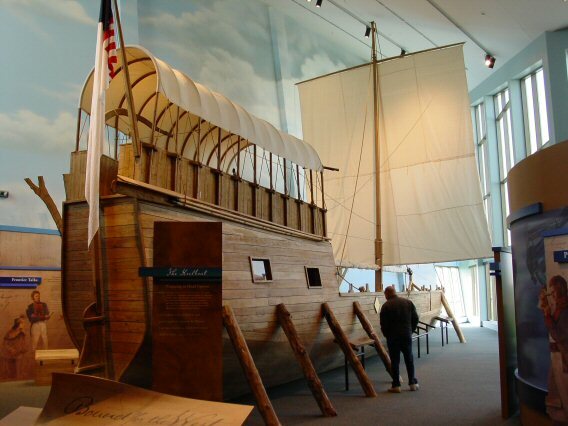 Enter a world of discovery through the doors of the new Lewis & Clark Interpretive Center near Hartford, Illinois. The Center consists of over 14,000 square feet of exhibits, displays, artifacts, and multimedia renderings that emphasize the Corps’ preparations for the expedition. The Center is open for free public tours, and is administered by the Illinois Historic Preservation Agency. On December 12, 1803 Clark and his men entered the River Dubois near the present city of Hartford, Illinois and pulled up on the southern bank. The river's mouth was a good harbor for boats and the location was very close to the mouth of the Missouri River, the route chosen for the expedition. Most importantly, the location was in United States territory on the east side of the Mississippi River, which would honor the Spanish Commandant's ruling that the expedition stay out of the Louisiana Territory until it was transferred to the U.S. Clark chose this spot for the expedition's winter camp. Clark's men built a road from the mouth of the River Dubois through the forest to nearby prairie: "fixed on a place to build huts Set the men to Clearing land & Cutting Logs - a hard wind all day-flying Clouds, Sent to the neghbourhood, Some Indians pass," was the December 13 entry in Clark's journal. Then, based on Clark's plan, they began to build temporary housing for themselves and to set up the camp. They partook of the plentiful wild game for food: "Send out Shields & Floyd to hunt to day, they Kill 7 Turkeys verry fat," wrote Clark on December 21. By Christmas Eve, 1803 the men were able to sleep indoors. Lewis rejoined Clark several weeks later and moved into the camp, which he later dubbed "Camp River Dubois." Christmas Day 1803 was busy at Camp River Dubois, as Clark noted in his journal: "Christmas 25th Decr:...found that Some of the party had got Drunk (2 fought) the men frolicked and hunted all day, Snow this morning, Ice run all day, Several Turkey Killed...Three Indians Come to day to take Christmas with us..."
The winter was spent making observations at the mouth of the River Dubois and other locations. These observations were performed largely by Clark to fulfill Jefferson's first instruction: "Beginning at the mouth of the Missouri, you will take [careful] observations..." For example, both men maintained a weather diary, noting weather and climate observations each day. They also made astronomical observations, some performed in the middle of the cold winter night. On Monday, May 14, 1804, the Expedition, under Clark's command, left Camp River Dubois on the east side of the Mississippi River and sailed up the Missouri River, beginning their voyage of discovery. Lewis, in St. Louis making final arrangements, planned to meet the Expedition at St. Charles, Missouri. In the journals, Lewis designated the mouth of the River Dubois in present-day Illinois as the official "point of departure."